Israeli soldiers attacked, Friday, the weekly procession against the Annexation Wall and Colonies in Kufur Qaddoum town, east of the northern West Bank city of Tulkarem, wounding three Palestinians with live fire, and causing dozens of suffer the effects of teargas inhalation. Morad Eshteiwi, the media coordinator of the Popular Committee against the Wall and Colonies in Kufur Qaddoum, said the soldiers resorted to the excessive use of force, and fired many live rounds, gas bombs and concussion grenades. He added that the soldiers shot three Palestinians with live fire; two in their legs and one in his face, before they were rushed to Rafidia Governmental hospital, in Nablus. Many Palestinians suffered the effects of teargas inhalation, and received the needed treatment by local medics. Eshteiwi said that the Palestinians will continue their legitimate struggle against the ongoing occupation, its illegal colonies and the wall, and added that Jerusalem is the core of the Palestinian people and the essence of their national identity. 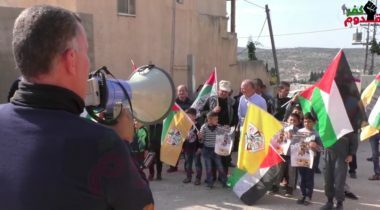 The protesters also denounced the escalating Israeli violations against the Palestinians, their homes and lands in occupied Jerusalem, and denounced the abduction of its governor, Adnan Gheith, along with various political leaders and nonviolent activists.